The main problem with Ponzi schemes is that they implode due to market saturation. Pyramid type investment structures funnel money to the top, while leaving the majority of participants at the base as bag holders. There are no paid dividends to any investors. The purpose of using bitcoin isn’t to recruit new participants. There’s no centralized body that funnels money up to the top. Unlike Ponzi schemes, Bitcoin will still have value and continue to function even if no new participants join the ecosystem. Im sorry that you are butthurt. You skeptics have said the same thing at $1000 $5000 now $10000. See you at $20k. Roofie don't worry about BP or what he says. He is jus a shill Jack hired to stir things up and generate traffic. I bought the last of my $642 of US Dollars ($1000 limit/week) allowed before it gets above 12,000 again. ^ What is appropriate? The fifth Beatle calls in? There was a lot of speculation about the Beatles in the 1960's including about whether there were five members of the group and one dropped out to pursue other options. A big joke line in a lot of SNL skits in the 1970's. It may not have ever been true. Ok, how does that apply to bitcoin? or I should say ML post? I was hoping the ^ key meant that I was referring to the post above and the girlfriend wants to break up with James when all he was talking about his 50 cent bitcoins then she asks a month ago "How have you been?" with a thousand coins worth over a million. James may have had many thousands. 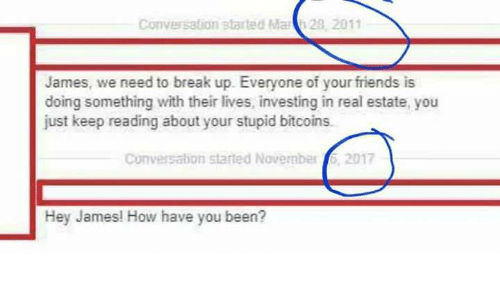 She clearly thought James should have been investing in real estate instead of bitcoins. Now she wants back into James' life as a millionaire. I understand your use of ^ and also understand ML post. Now tell us how your post(beatles) correlates to that post of ML. Are you insinuating one of the various people who have been called the 5th beatle quit, then wanted part of the fame and fortune after the the fact? Natty was your contract with Genesis open ended? If so are you still receiving payments? Mine have gone way up and I have doubled my money and with it being and open ended contract for as long as it is profitable I can't see payments stopping any time soon. Just curious how yours went. the one worry with bitcoin, is that with more and more people joining the ride, at a crazy rate, is it really possible to have a system where a decent % of the population is just going to keep making easy money with what seems like virtually no risk? There's going to be a point where the market becomes oversaturated......I don't think the ceiling is now, just throwing that out there. over-saturated market means it deosnt make sense to enter it because so many others are doing the same thing. In that context bitcoin isnt the only crypto currency in fact new ones pop up all the time. Most are more volatile than bitcoin, much more, and those ICOs are the ones you have to think to yourself " isnt this market saturated?" How many Bitcoins are currently in circulation? Yea, its open ended. I have just about broke even now on amount of bitcoin I could have bought for what I paid for mining contract. Everything in next couple weeks will be all profit bitcoin. How Many Bitcoins Have Been 'Lost' Forever? the number of bitcoin has a controlled supply, meaning that the amount of coins that can be mined are finite. The amount of Bitcoins actually in circulation is far lower than the amount of Bitcoins in existence, due to accidental loss or willful destruction. Of the 16 and a half million Bitcoins that have been mined so far, it is estimated that up to 25% have been lost for good. Bitcoin has a controlled supply, meaning that amount of coins that can be created are finite. The Bitcoin protocol is designed in such a way that new bitcoins are created at a decreasing and predictable rate. The number of new bitcoins created each year is automatically halved over time until bitcoin issuance halts completely with a total of 21 million bitcoins in existence. When I had an old laptop needing a new $110 battery. I just called it a $110 discount off of a new one and trashed the old unit. If it had a few bitcoins worth a few bucks and I did not care, they would be lost. The CBOE plans to launch bitcoin futures, announces an agreement with Winklevoss brothers' digital currency exchange. In a futures contract, it is a contract for real things or money things. #1 Real things are wheat, gold, orange juice or lots of things. See Eddie Murphy in Trading Places. It has an excellent explanation and a funny movie. #2 In the index futures accounts like S&P, US Bonds, Euro, and many monetary contracts, the contract is settled by a cash exchange. Bitcoins are a #1 item. If you sell them short, you must produce the real bitcoin or find a replacement from a willing seller on delivery day at the location in the contract. A small personal anecdote will show how this can backfire big time. The wheat crop got frozen in 1994. Wheat prices rose from $3.50 and kept going up to $6.20. I talked to a corn broker and he was in his pit on delivery day the morning that March 1996 wheat was closing at noon. Some people may not have known about the "must deliver" part. A wheat broker is trying to buy 80 Mar wheat. He offers 650, 651,652, @ 650 he hits it up by nickles, then dimes. By now the guys in the corn pit have stopped trading and are watching the action next pit over. The broker repeats the price 3 times and he tries the next dime up. He does not find a seller until it hits 720. A grain contract is 5000 bu so someone takes a $5000 X 80 contracts loss. I think that someone is going confuse bitcoin with a #2 coin like if I owe you 100,000 EU, I just pay you the exchange rate X contracts in US Dollars. I think for a few months or quarters if they follow money examples, buyers will make money until some big-time players start selling short like George Soros did when he sold so many British Pounds, he broke the system. Then on one of those delivery days, the short position holders are going to follow the wheat short with 80 contracts except it may be a Soros' trade in the billions of dollars worth of bitcoins. At that time, bitcoins will be the new gold. I am just giving an educated guess probably around 12 million are still accessible. lost bitcoins are lost forever and never recoverable. satoshi nakamodo has a million but they have not been touched and probably never will. hundreds of thousands have been lost. could even be lower.